T-lymphocyte. 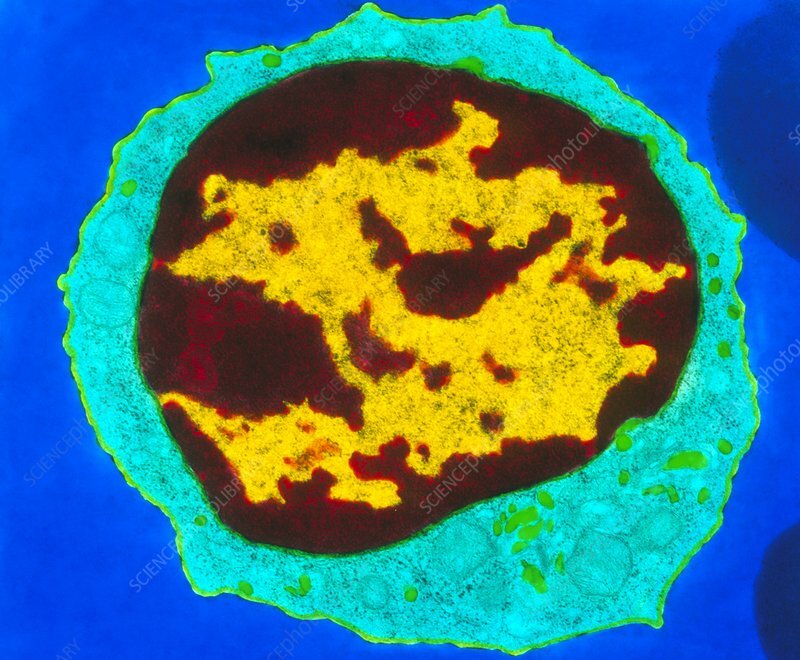 Coloured Transmission Electron Micrograph (TEM) of a section through a T-lympho- cyte white blood cell. At centre, the large dark nucleus is seen with yellow chromatin. The rough surface consists of microvilli-projections. Organelles are seen in the cell cytoplasm (light blue). T-lymphocytes are cells of the human immune system, produced in bone marrow and which mature in the thymus gland. There are three major types of white blood cells: granulocytes, lymphocytes and monocytes, which protect the body against invasion by foreign substances. T-cells are attacked by the HIV virus which causes AIDS. Magnification: x8000 at 6x7cm size.